As the 2017 winds to a close, it is awesome to be able to reflect back on such a great season. As of Saturday night, October 14th, we surpassed our last season’s win total. This is to be expected in a sense, but what makes it more rewarding this year is that we did so in spite of losing a few drivers this year to family and work obligations, and having other drivers and teams that were only able to compete in a fraction of the races that they competed in last season. All in all, PCD Teams put up a win percentage approaching 35% for the season, with a top 5 finishing percentage closer to 80%. It would be difficult to be disappointed with those numbers no matter how you break them down. We are very excited as we begin preparations for the 2018 season and hope to continue to increase our level of success from week to week. Before I go any further, I want to thank ALL of our friends, customers, and teams for all of their hard work this season. It has been awesome seeing the success you all had this season. I am definitely looking forward to seeing what we can do in 2018. From JC Morton winning the Battle at the Bullring to kick off the year, through Travis Dickson ending the season with a Renegades of Dirt win, and all the wins from all of the teams throughout the season, it has been a great year. Thanks again to all of our team members for letting us be a part of your success! Randy Brown picked up the Merced Speedway track championship for the 2nd consecutive year in the IMCA modified division. 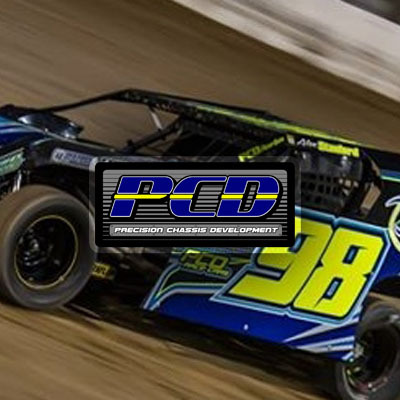 Randy ran a limited schedule this year, but still amassed enough wins and top 5 finishes to bring the track championship home in his D.C. Brown Racing, PCD IMCA modified. Congratulations to Randy, Sabrina, D.C., Cody and the rest of their team on their success this season! Travis Dickson came to the PCD team this season as our first competitor east of the Mississippi River. Travis put together a 10 win season in the AMRA modified division, capping it off October 14th with a dominant win at the Renegades of Dirt Fall Finale at Atomic Speedway in Waverly, OH. In the process he was crowned the AMRA National Champion in the modified division. Travis’ family has deep roots in the Ohio Valley racing community, and he stepped up this year to fill some big shoes. He won races this season at every AMRA track that he competed at, and did so with class. The Dickson family (Travis, Chris, Mark, Kelsey, and all of the others that I’m surely missing) represented PCD well, and we are grateful to have them on board with our program! Rick Diaz won somewhere in the neighborhood of 70% of the races he competed in this season. Alex Stanford found is way back to victory lane after a lengthy recovery from an early season surgery. Mark Wauge picked up multiple wins for the season, as did BJ Wild. JC Morton won several big USRA B-mod shows early in the year, along with picking up his first ever USRA Modified wins. Kelly Leeper picked up his first ever Wissota B-mod win, and Monte Bischoff went into his retirement (hopefully temporary) from racing on a feature win as well. Congrats to all of these guys and their teams on their success. Stay tuned for more updates as we move into the off-season, crank up production, and continue to move forward with our operation. Best of luck to everyone as the 2017 season winds to a close! Before I get into the mid-season update, I have one more point to make on the idiotic decisions we’ve seen from some chassis builders this season throughout IMCA, USRA, and UMP / AMRA events. I’m referring of course to the rash of 0.065″ wall thickness roll cages showing up in these different sanctioning bodies. 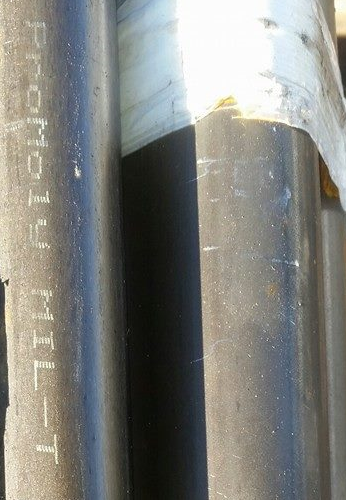 So far we’ve heard everything from “we only did it because our customer asked us to” as well as the argument “the type of steel we used was just as strong in 0.065″ wall thickness as 0.095″ wall thickness DOM”. The “we only did it because our customer asked us to” defense is really no defense at all. It’s stupidity, and it is irresponsible. A customer is just that, a customer. They do not own the business, the assume no liability for the business, and they should have no say in a business’ decisions on safety and well-being of other racers. There is no defense to that. Now, onto the “0.065 inch thick 4130 is as strong as o.095 inch thick DOM” defense. Yes, that statement is accurate in a perfect world, with perfect conditions, perfect fit-up of tubing, and perfect welds. The problem (other than being against the rules) is that none of the cars I’ve seen thus far with 0.065″ thick 4130 tubing cages have met any of those criteria. They appear to have been built using the same processes and procedures as a basic 0.095″ wall thickness DOM tubing chassis, and in most instances these processes and procedures are inadequate for the thinner, more heat sensitive 4130 tubing varieties. I’m not in the camp that says 4130 can never be mig welded. I’ve seen that statement proven wrong multiple times. I will however maintain that all the steps involved in building a 4130 structure (especially in thinner tubing) are more delicate, and require much more attention to detail. And in reality, although it can be mig welded, I’d heavily suggest the ultra-thin 4130 varieties be tig welded by someone who knows what they’re doing when we’re talking about roll cages, and keeping people alive when a night at the track goes bad. The 0.065 inch thick cages are 30 lbs lighter (max) than a legal cage. Sure, it’s 30 lbs, but it’s 30 lbs right in the center of the car, which has a relatively small to non-existent effect on handling. Put into simple terms…if your chassis builder is building a car with a 0.065 inch thick roll cage, find another chassis builder as there are many great options available to you. As far as our mid-season update goes, we’re currently sitting at the highest number of wins we’ve ever had at this point in the season, and we’ve done so with a very small number of cars in regular competition. When averaging all of our finishes for the year, we’re averaging roughly a fourth place finish with all of our drivers who compete regularly in USRA, IMCA, AMRA, and Wissota events. That is a very solid number, and we are very proud of our teams for how well they’re doing in competition. Up until this year, we’ve been average a small number of cars per year, usually around 6. However at this point in 2017 we are currently backlogged 15 cars due to the success our teams are seeing from the east cost to the west coast. We are currently running both chassis jigs so that we can keep cars rolling out to our customers in a timely manner. Watching the growth we’ve experienced this year has been very exciting, and we’re doing our best to keep the best people we can in the shop so that as our clientele grows larger, our quality continues to stay at the highest possible level. Congrats to all of our teams on such a solid first half of the season. We’re really looking forward to seeing what we can do as the tracks slick up in the warmer weather! There has been a considerable buzz lately about tubing options different builders use in the production of their chassis. Everything from cars being built with illegally thin roll cages using higher strength alloys, to hype about one particular brand of one type of alloy being the be-all, end-all of chassis material because of one driver winning on race on a car built from that alloy. A couple of posts ago I went through some general information on ProMoly (4130), Docol R8, and standard DOM tubing. I did not mention ERW (Electric Resistance Welded) tubing, as it is my opinion that the only place ERW tubing has on a race car is the bumpers or nerf bars. There’s absolutely no reason for it to be used on anything structural within the chassis as DOM tubing can be purchased for pennies more per foot and is much higher strength. First off, since this came up in the shop today, there has never been a PCD Chassis built with a roll cage that is less than 0.095″ in wall thickness. None of our customers have ever made such a request, and if they did, they’d without a doubt be denied their request. The picture I set as the featured image for this article is from a bundle of ProMoly steel on an order I received in 2015. Since ProMoly tubing is being pushed as some big, miracle material in some circles at the moment, I thought it would be funny to show that we’ve been using it here at PCD for quite some time. As I’ve noted in other posts, we do use Docol R8 very often as well. Both are excellent products, far higher in strength that DOM of any variety for which we have received mill certifications. That said, both have their own quirks in how they form, notch, and weld. A concern that customers should have when a builder starts using the higher strength alloys in order to drop down wall thicknesses and try to save weight is that fabrication and welding practices become much more critical than they are with the heavier, more heat tolerant DOM varieties. Docol is more tolerant to less than optimal fitting and welding practices than any of the 4130 varieties. But, neither are as forgiving as DOM varieties. So, you could easily have a company who has fairly loose fitment requirements and less than optimal welding procedures that has a reasonably low number of failures in chassis built from DOM tubing of heavier wall thicknesses. The problem is that when you apply those same practices and tolerances to thinner wall tubing in less forgiving alloys, you greatly increase the likelihood of failures, specifically in heat affected areas. As with anything, this is just another case of buyer beware. If the builder will not willingly answer your questions and show you proof that the information they are giving you regarding their standards is accurate, you should probably consider a different chassis builder. There are many excellent chassis builders in the business right now. So, do your homework and know what you’re getting for your money. As a general rule, a chassis that is notched and fit correctly should not have any gaps that you can fit a 1/16″ diameter piece of tig wire through. The chassis itself is one of the lowest cost items you’ll deal with throughout a race season. Therefore, we encourage you to talk to several different builders, make sure you know what you’re getting, and be willing to put down a few extra dollars for a quality product. It’s common practice now for people to spend $450 per shock, $700 on a set of birdcages, $700 plus on graphics, $2500 on a quickchange, etc… So, is a few hundred dollars difference for a higher quality chassis really where a person should skimp? As always, if you have any questions, give us a call, or send us an email. Our contact information is available on the website or on our facebook page. Until next time, good luck at the track! The start to our 2017 season continues to be strong here at PCD Race Cars. Travis Dickson and Rick Diaz are off to particularly strong starts, winning over half of the shows they compete in thus far. Dickson is our first PCD driver to compete east of the Mississippi River, and he currently maintains a lead in AMRA points, having put together four wins in twelve starts, and having only one finish out of the top five. Rick Diaz is off to a dominant start in the IMCA northern sportmod division in California. At this point in the season he was won each time he and the 7-one-four motorsports team have attended an event. Monte Bischoff has now found his way to victory lane, early in 2017 as well, joining JC Morton, and Mark Wauge as well in the win category for the PCD team. At this point last year our small constituent of drivers had put together four wins, whereas this year we’re sitting at thirteen wins, even having had less cars in competition at this point in the year. Alex Stanford is in the process of getting his new, tig welded, Docol R8 PCD assembled, and should be back in competition sometime in the next month or so. Alex has been out so far for 2017 recovering from an operation on his back, and we’re very excited to see him getting ready to be back on the track. Having mentioned Alex Stanford’s Docol R8 car, I wanted to take a minute to answer a question I’ve received frequently as pictures of the Docol R8 USRA B-mod (the car JC Morton won The Battle at the Bullring, and two nights of the King of America B-mod division) and pictures of Alex Stanford’s 2017 chassis have been posted. Question 1: What is the cost difference between a standard frame and a Docol R8 frame? Answer 1: If the customer wants a mig welded, Docol R8 chassis, the cost difference is simply that of the difference in tubing from DOM to Docol R8. This is approximately a $750.00 difference. Question 2: Does Docol R8 have to be tig welded? If so how much does that add to the cost? Answer 2: Docol R8 does not have to be tig welded. We do prefer tig welding these frames, but, Docol R8 is suited for mig welding as well. As far as cost for tig welding, it adds $1000 to the cost of the chassis. Question 3: Do you offer chromoly (4130) chassis? Answer 3: Yes, we have done 4130 cars in the past, and we’re very open to doing more of them. Cost would be about $200 less than a Docol R8 chassis. Question 4: Are Docol R8 chassis faster than standard DOM chassis? Answer 4: I have no idea how a person could legitimately answer that question. I can tell you that JC Morton, in his first 4 races in our Docol R8 USRA B-mod, racked up over $10,000 in winnings. I have no way to prove that this is because of the material used. But, I have no way to prove that it isn’t either. Hopefully that addresses most of the FAQ’s I’ve received. If not, contact us at [email protected] with any further questions. -Thanks!